Apparently Hollywood is working on a blockbuster movie about the Greek gods. Uma Thurman, Pierce Brosnan and Sean Bean have signed on to play Medusa, Chiron and Zeus, respectively. 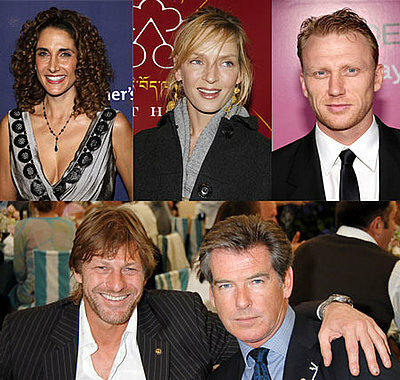 Kevin McKidd (Poseidon) and Melina Kanakerides (Athena) are also joining the heavenly bunch in the Chris Columbus-helmed pic. The studio is still looking to fill the roles of Aries, Hades and Persephone. Logan Lerman and Brandon Jackson have already signed on to topline. Story centers on Poseidon’s half-human teenage son (Lerman), who embarks on a quest across modern-day America to save his mother, return Zeus’ stolen lightning bolt and prevent a deadly war between the gods. Lensing begins next month in Vancouver, with the studio setting a February 2010 release date. Who’s going to be playing Annabeth Chase? logan lerman looks like percy but is way to old. brandon T. Jackson is also to old and does not look like Grover at all. the girl playing the role of annabeth is 24! and shes trying to play a 12 year old. its not what the book described!! i really don’t know why they just can’t respect the book! okay im in love with the books and im still shakey on how the movie will turn out but i hope it will be okay….. but yes i see many flaws already. the fact that the actress playing annabeth is 20 something and percy looks way too old to be a 12 year old (although he is hot….) and annabeth is a blond but the actress isnt, um…. there was one more but i cant remember….oh and whats with grover? thats not how i pictured him. oh well i hope it willl be alright. 2.They all look sooo old, not like 12 years olds! 5.The guy who plays Disonyus (is that how you spell it?) Looks more to me like a Grover not Disonyous! 6.Oops I have a 6th little problem: In the movie preview Percy doesn’t know about the pen!!!!!! But HOW could he have already used it and not know it’s a pen/sword! First of all Alexandra Diddario is not 24. Second of all I am not too old to be in this movie. And you spelled it wrong its:Dionysus. yeah like Clarisse is SOOOOOOO important. i can’t believe they left her out!!!!!!!!!!!!!!!!!!! I agree with all of you! Whoever was in control with casting did not do a good job at all! Percy looks way to old to be twelve(even though he his HOT! ), And when they make the other books into movies, he’ll look like he’s 20 instead of 16. The girl who plays Annabeth is WAY too old and looks nothing like her along with Brandon who plays Grover(even though he makes Grover look cooler and I’m a 100% sure he isn’t black) and who plays Clarrise? I hope they don’t mess up on her. I saw luke in the previews for like 2 seconds, he looked ok. Actually, from what i saw so far, he the only character they haven’t screwed up on but I’m still DEFINATLY going to see it!!!!!!!!!!! First of all, Annabeth (Alexandra Daddario) is not 24. She is younger than that. Second of all I, ( Logan Lerman) is not too old for the movie, but I love all of you who said I am hot. Hope you like the movie! I can’t wait to see the movie. But there are alot of flaws. 2 Grover totally does not look like the way they described him the book. 3. Logan is way to old to play Percy. so do you think the movie is going to be gust like the book ……. so SHUT UP and do you think you can make a better movie LOGAN IS HOT !!!! Ok, I saw the movie and was not at all impressed. It could have been a different movie, not based on the book! The movie was okay,a four out of ten. But I was kind of waiting for it to end. At the end, Luke got thrown into the hudson river and I was confused about what actually happened to him. Also they made Hades seem like the bad guy. AND they didn’t include Ares or Clarisse! And where was Dionysus or the Oracle? I was disappointed. The graphics were weird too. They took away the chimera part and put in a whole new hydra part. The quest was different too. Percy was supposed to get the pearls he receives from the woman he sees in the lake. Also in the movie Grover stays behind in the underworld while Percy saves his mom. I didn’t like the movie and I hope they don’t make a sequel. (but even if they do I’ll still see it) Thanks for reading! Logan may have been a little older than what i expected ( but still hot) and the movie was okay, but out of order and nothing like the books at all. I hope if the make a movie on the sea of monsters it at least has tyson in it, but he has to be big and not the least bit skinny. Don’t get me wrong but i think the movie was okay but the books were great. and hopfully they put clarisse and ares in the movie or i’ll give the director a piece of my mind!!! Logan might not be the right person to play percy if you were a control freak and wanted the movie to be perfect, but i think he did good in the movie. I went to see the movie and thought it was ok, but if they don’t put clarisse in the next movie i just might give somebody a piece of my mind! i know those books were SO good that i went and bought all of them and read them a least 3 times, and your right mena logan is hot, alexandra is a good actor, and you can never be to old. Logan i have a question for you if you ever see this. will you be in all the percy jackson movies with Alexandra, and the person who plays Grover or are the going to switch people or make only one more movie? God all the haters grow up so what the girl playing Annabeth is 24 which i very much doubt and hell yeah Logan Lerman is positively the hottest i have ever seen the movie was great and i love Grover so what Poisedon’s hair is blonde personally i’m into dark haired guys but i will make an exception for him cause i think he is so adorable anyway where was i, i think you should really just stop whining you go and try and make a movie and see how it feels when a bunch of whiny fans a whining over the age of the actor playing Anabeth or how they should twelve but being Seventeen works much better i think. Oh by the way did anybody see the guy who played i thought i had died and went to heaven what a gorgues guy they better show him lots in the other movies.